The school holiday's about to start. That means it's the best time to get kids cooking. They can get into it so much that may be they'll be able to help you out during the school terms even. So for this week's Shop Savvy we'll have a look at easy recipes to make with kids! This Sweet Potato and Chickpea Stew by Deliciously Ella is a heart- and tummy-warming family favourite. You can use your milk of choice (dairy, soy, and coconut have all worked well so far!) and if you haven't got a variety of spices you can substitute with curry powder. Simply stuff and eat. That's tacos. And the options are endless! Go for the classic Beef tacos, or try grilled veggie and bean. Something so simple like eggs en cocotte (eggs baked in ramekins) served with sourdough or salad can be made in 15-20 minutes. Fish cakes make a great finger food. They're also great as a main on weeknights for a quick meal. You can use fresh boneless white fish, or use tinned tuna or salmon instead. Have fun with the dipping sauce too; satay, sweet chili, soy... dipping makes everything much more fun right? A simple spag bol for a family dinner on a Saturday night. A great comfort food I think! Try adding some lentils for more economical options and a thicker & richer sauce experience. 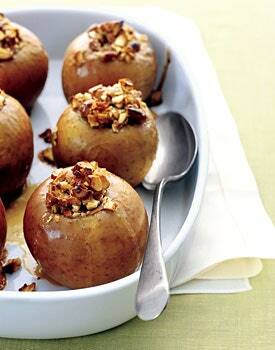 Baked apples stuffed with honey, almonds, and ginger. What a perfect weekend sweet breakfast recipe! It does take a while in the oven, so pop them in and snuggle back in to bed until its ready. Get hands on! Making gnocchi from scratch is super fun! Yes, it becomes quite messy. But it's all very worth it. So, what supermarket specials can we stock up on this week to get cooking? Australian Red Delight Potatoes (2kg) $3 each. Annalisa Beans (400g) $1 each.